What Kind of Automatic Guided Vehicle is the Right Machine for the Job? Providers of automated guided vehicles (AGVs) are often asked which type of AGV is the best. The answer, almost every time? It’s not a particularly satisfying answer, however, there some advantages and disadvantages to each type of AGV, so here’s a master post that will hopefully shed some light on your choices. Capable of handling pallets, racks, and rolls, counterbalance AGVs feature a counter weight that helps to stabilize the load carried by the forks. While the footprint of this design can be slightly larger than other forked AGV designs, it features a lift mast mounted at the rear of the vehicle. This keeps the AGV clear of loads and increases its versatility, especially when it comes to handling multiple load types. Aside from this, the counterbalance design also minimizes the width of the AGV. Categorized by legs that “straddle” loads, the outrigger (or straddle) AGV stabilizes loads using these legs. This feature offers more support to the load as well as to the AGV itself. It can also handle several different types of loads, including pallets, racks, and rolls. 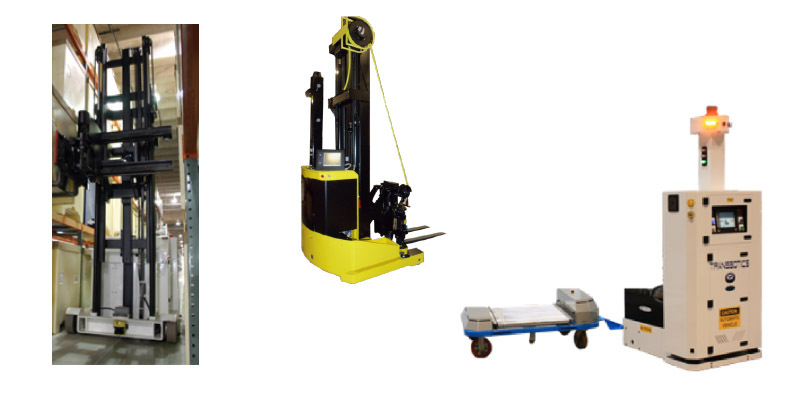 Compared to a counterbalance AGV, the outrigger has a shorter footprint, although its width is typically larger. This smaller footprint also means that the outrigger has a bit more maneuverability. Forkover AGVs are best suited for handling open-bottomed containers, like Euro-pallets and wire baskets. One of the reasons for this is the two horizontal stabilizing legs, which sit beneath the forks. This also results in a smaller footprint compared to other forked AGVs and offers the forkover the greatest maneuverability in tight areas. Ideal for work inside warehouses and distribution centers, narrow aisle AGVs typically help service high-bay racking. 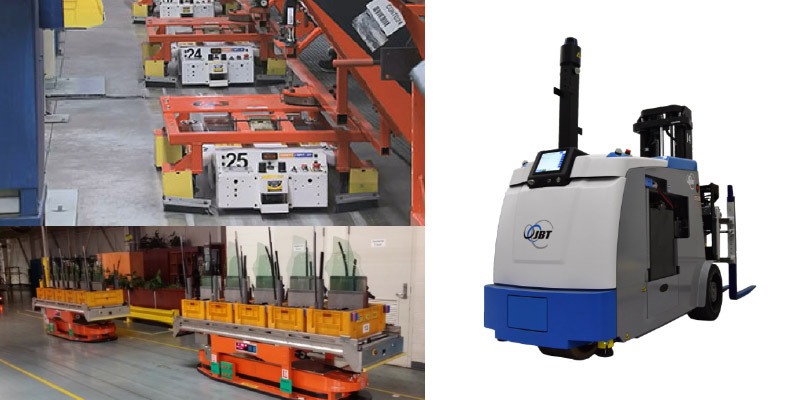 Some models include trilateral turret fork attachments, which enable these AGVs to enter a narrow aisle, pickup at any storage location in the rack, and transport loads through the aisle to required delivery points. Best suited for servicing double-deep racking, reach AGVs can reach outside of the footprint of the vehicle to pick and drop loads. The forks mounted on the vehicles extend to lift or to place the load in designated locations. Towing, or tugger, AGVs are most often used in the automotive industry. These vehicles pull wheeled carts, which carry customer product. 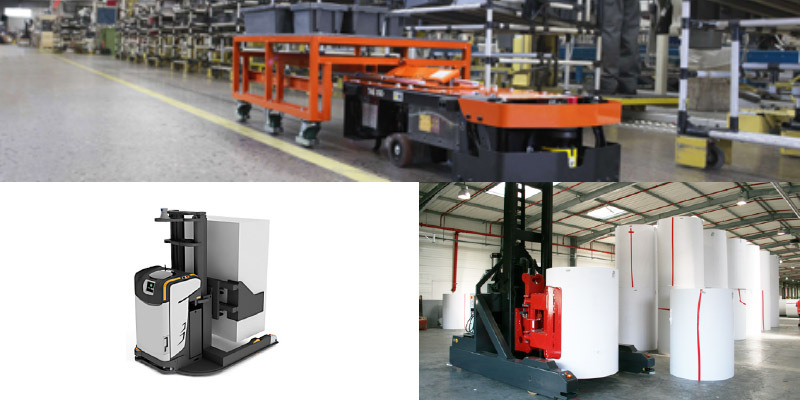 Compared to other AGV types, tuggers can support a greater throughput, as they transport more loads per. These vehicles may also interface with other automated equipment, including forked AGVs. However, towing AGVs do not have the same degree of flexibility as their counterparts. They’re more limited in terms of what loads they can transport, and they often operate in simpler guidepaths. Unit load vehicles, sometimes referred to as “top carriers,” can carry various different types of loads. These vehicle types date back to the earliest versions of AGVs and transport product on top of their structure. Capable of handling pallets, racks, and smaller loads, conveyor deck AGVs have rollers that can transfer loads to and from conveyors. Most of these vehicles can load and unload in both directions, which helps improve operational efficiency. In addition to conveyor interfaces, these AGVs can also work with automated storage and retrieval systems (AS/RS). These vehicles, however, can’t pick up loads from the floor. Lift deck AGVs work best with stands, where they can lift pallets and racks. One of the advantages of these vehicles, their ability to carry several different types of pallets, regardless of their size, gives them a lot of flexibility. 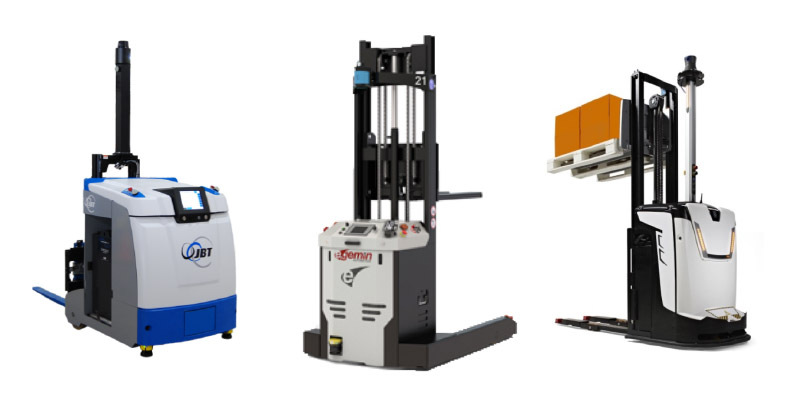 Most lift deck AGVs can be equipped with a range of lift heights. This allows them to better conform to the demands of your specific application. Aside from stands, these vehicles can also interface with conveyors and AS/RS. However, like conveyor deck AGVs, they can’t pick from the floor. Over the years, some specific, unique types of applications have resulted in the development of special application AGVs. These vehicles have a defined skill set and work in a limited set of applications. Automated trailer loading (ATL) AGVs are forked vehicles that automatically load standard, over-the-road trailers. Equipped with a single/double fork attachment, these vehicles can handle single or double loads. This flexibility helps support multiple loading patterns. While the body design of clamp AGVs resembles other forked models, like counterbalances or outriggers, they are equipped with clamp attachment. This enables them to handle either un-palletized materials – with a flat clamp – or rolls – with a roll clamp. Used primarily in the automotive industry, automated guided carts, or AGCs, are small, easy-to-install vehicles that typically run in continuous loops. Their simple navigation systems and minimal carrying capacities mean that they are low cost. When compared to AGVs, AGCs have limited flexibility and functionality. These vehicles usually only tow or lift carts as a payload. 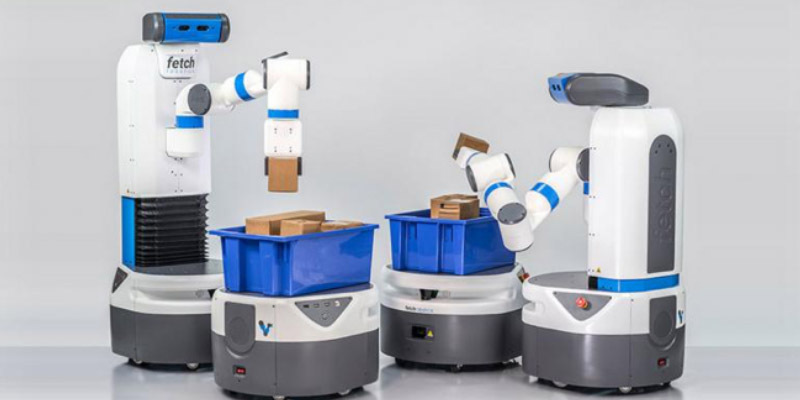 An emerging term used to distinguish small, flexible vehicles from AGVs, automated mobile robots (AMRs) possess a few key characteristics that differentiate them from traditional, industrial AGVs. Most often, AMRs are low profile and almost resemble skateboards. They typically do not use any form of fixed guidance paths, regardless of whether these are physical (i.e. magnetic tape, painted lines) or virtual (software-based). AMRs will navigate around an obstacle in order to avoid it. When compared to AGVs, AMRs handle smaller payloads and have limited vertical transport capabilities. Clearly, there’s a wide variety of AGV types. All of them have a great deal of flexibility, but some fit particular applications better than others. If you’re looking for more information about a particular AGV type or what vehicle might best fit your project, contact MHI’s AGVS group.